Time is certainly of the essence when you go in to see your doctor. Apart from the six-month wait-time and (hopefully!) twice-a-year frequency, you may feel rushed during the appointment and walk away wondering if the trip was worth it. But what if you could walk away from your visit with insight and goals for better diabetes management? You can! 😆 So how exactly do you make the most of the precious time you have with your doctor? If you really want to take full advantage of your doctor visit, plan in advance. These key points will make for a very informed doctor's visit. Use our suggested talking points below, and add your own! How are you doing overall? Do you have any one specific complaint that sticks out? Any updates since the last check-in? What medications are are you taking? How often? What dosage? Need any refills? Anything you've stopped taking? Anything you've been researching and want to know more about? Check out your One Drop BG stats from for the past month. This includes a lot of summary information, so make sure you take the time in advance to properly prep! What's your average BG level? % high, % low? How does your food intake affect these numbers? What's your average daily insulin intake based on the information you've entered into your One Drop app? (Pro Tip ⭐️ : if you're taking insulin, One Drop provides the average total daily insulin and the breakdown into %basal and %bolus insulin.) What's your average daily activity, and how does that seem to be affecting BG numbers? A topic often overlooked in appointments, mental health is something that should take tip-top-priority on your talking points list. How are you doing psychologically? How does diabetes affect you mentally? Are your major highs/lows taking a toll on you psychologically? What was your last, and how do you feel it might have changed this time around? What should be your new target A1C value? Do you have lots of high BGs ("hypers") or lows BGs (“hypos”)? If so, are they occurring often? Are you finding trends or patterns? How severe are they? Can you feel the early signs of a low and take action before it becomes too severe? What do you eat/drink to treat them? How quickly does your body respond? 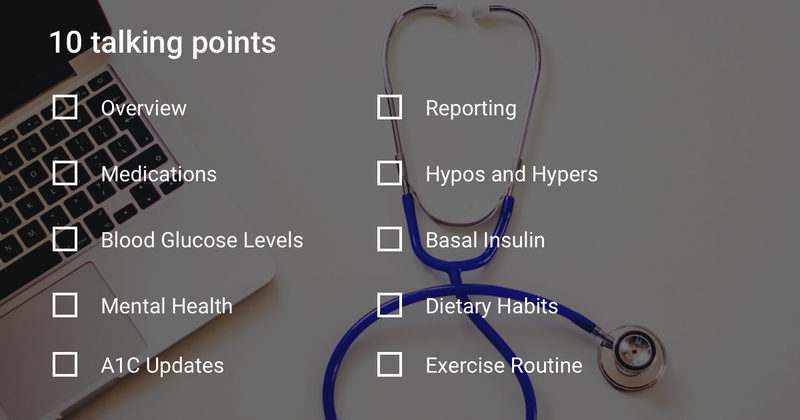 When do you get the most severe highs (highest glucose levels)? Is that associated with food, medications, activity, all three, or other factors (stress, illness)? Any idea what may be causing these highs and lows? If you're taking basal insulin, how do you adjust your insulin dose? What adjustments have you made since your last appointment? What are you basing your basal adjustments on? Do you adjust basals at all? Do you have a prescribed diet? How well are you following your diet? What foods are working best to keep your BGs stabilized? Worst? What is your physical activity routine? Have you been following a particular regimen? Does it help keep your blood glucose under control? Does it make you feel healthier in other ways? How often do you follow it? What trends have you seen in BGs from following that routine? But remember, this is your time. Don't be bashful with your questions. Come prepared, and you'll be able to make any and all necessary changes. Use this list as your very own checklist! And add in your own specific questions to make sure you receive the absolute best care possible at your next check-in. You'll be happy you did.